ALBA’s George Watt Memorial Essay Prizes are awarded annually to a graduate student and an undergraduate student who have written an outstanding essay or thesis chapter about any aspect of the Spanish Civil War, the global political or cultural struggles against fascism in the 1920s and 1930s, or the lifetime histories and contributions of the Americans who fought in support of the Spanish Republic from 1936 to 1938. The award was first established 10 years ago to honor the memory of Lincoln vet George Watt (1914-1994), a writer and lifelong activist central to the creation of ALBA. Watt’s distinguished action in war continued after Spain. His bomber was shot down in 1943 over Belgium, and two of his crew were lost. 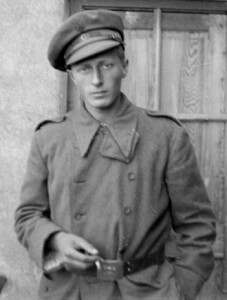 Receiving support from members of the Comet Line, a clandestine organization active in helping the Allies inBelgium and France, Watt managed to make his way from France into Spain and, eventually, back to England. During this journey Watt faced serious peril because he was both a Jew and an American. Each year, as ALBA grants the George Watt Prize, we are reminded of Watt’s inspirational example of committed anti-fascism and work for social justice. The jury, consisting of Soledad Fox (Williams College), Rob Snyder (Rutgers University at Newark), and Gina Herrmann (University of Oregon), is pleased to announce the results for this year’s contest. We received 15 submissions for bothcategories combined; six essays were in Spanish, nine in English. The jury was impressed by the international profile represented by the student authors, as well as with the quality and the scope of the essays. The essays addressed many topics, including the poetry of Langston Hughes, the political writings of Margarita Nelken, jazz and the songs of the Spanish Civil War, and Spanish Civil War monuments and the politics of commemoration. Christopher Bannister, a PhD researcher at the European University Institute, won the graduate prize with a selection from his master’s thesis, “The Rival Durrutis: The Posthumous Cult of Personality of Buenaventura Durruti, November, 1936–June, 1937.” His research concerns the posthumous cult of personality of Buenaventura Durruti during the Spanish Civil War and details the rise of the living cult and the perpetuation of the cult following the subject’s death. The portion of this larger work submitted for the Watt Prize focuses on the cult in the period November 1936 to June 1937.